Luminous Beauty by Nutmeg Designs. Glass and Mother of Pearl on wood, 12×6 inches. $215. Author Shawna Lemay invited me into conversation about beauty on her blog Transactions With Beauty. I was curious where the title Transactions with Beauty originated, and then I read the quote on Shawna’s About page. The phrase comes from Rumi, the 13th Century Muslim poet from Persia. I feel an affinity for Shawna. She is from my hometown of Edmonton, AB, a poet, art lover and photographer, and in search of beauty. You are required to make something beautiful. I started the conversation with Shawna’s questions, finding what I had written about beauty on my blog to have something on the page rather than the uncertainty of where to begin. I discovered that seeking beauty is a thread throughout my writing. As I continued to consider Shawna’s questions, I slowly eased out the copied text and into my answers. Beauty is not always immediately apparent. Sometimes it is revealed bit by bit. 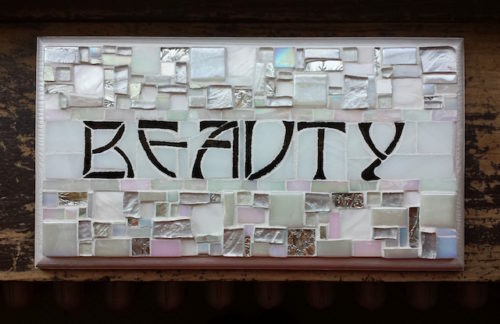 Read the interview here: Margaret Almon – A Mosaic is a Conversation.